At the risk of sounding like a broken record, all major asset classes have remained steadfast in their climb higher through the summer, unfazed by geopolitics, quantitative tightening, and the wrath of Mother Nature. In the current environment of low rates and equity valuations priced to perfection, we recognize that relatively modest weakness in earnings can reverberate across business supply chains, balance sheets, and capital markets suddenly and unexpectedly. We can’t predict what will cause that, as we’ll likely be wrong, but we do expect volatility to pick up off the current, excessively low levels. Rather than trying to time it, we seek to understand where the potential pressure points are and be positioned to mitigate those risks by allocating our partners’ and clients’ portfolios to exhibit the most sustainable long-term return opportunities. We are almost 100 months into an expansionary cycle since the great recession. The domestic economy has been stable as consumers and businesses continue to spend with access to cheap and readily available financing. However, as exhibited by Toys R Us filing for bankruptcy, there are obvious winners and losers, notably within retail, despite underlying consumer strength. This is most evident with the Amazon/WholeFoods combination making even the best operators sweat and scramble to expand their internet presence. Case-in-point, Walmart bought Jet and Bonobos with a share repurchase announcement to entice shareholders. Grocers, which were viewed to be better insulated from online competition, saw their peers reprice lower on the announcement. Real estate and REITs, especially those tied to malls, are also experiencing the fall-out from this phenomenon. Regarding monetary policy, the Federal Reserve governors have been scratching their respective heads as to why wage growth and inflation has not picked up while domestic GDP continues on its 2-3% growth rate and unemployment hovers in the low 4%’s. Nonetheless, Chairman Yellen has enough confidence to initiate a (painfully?) slow balance sheet reduction program with the potential for another rate hike at the end of the year. Balancing the budget has taken a back seat as the White House tries to hammer out tax reform, and while the success of passage is questionable, the benefit to the economy in spurring growth, repatriating capital and corporate reinvestment can be meaningful. On the international stage, despite political uncertainty, the European economy appears stable and earlier in its growth cycle. Brexit negotiations remain challenged as the UK seeks to extract itself from its ties to the EU while retaining the economically beneficial terms. The German government has gotten more complicated with Chancellor Merkel’s re-election overshadowed by the far-right party gaining a surprising 13% of the votes, forcing a coalition government. Nonetheless, the Bank of England has hinted at a potential rate hike and the ECB is also considering a start to the end of quantitative easing later this year. Even the threat of war with North Korea hasn’t been able to elevate the VIX off its lows for more than a few days. The broad domestic market has returned approximately 4.5% during the third quarter, driving a >14% gain thus far on the year. While September saw a strong rally in value stocks, growth has generally led the quarter (+5.9%) and the year (+20.7%). As we mentioned earlier, the battle between online and brick-and-mortar played out in returns this quarter, with Consumer Discretionary (+0.84%) and Consumer Staples (-1.35%) the laggards while Tech (8.65%) and Telecom (6.78%) led. Valuations based on P/E are at or near their 10-year highs across most regions and market caps but we see a greater spread of value across industries. Coupled with lower stock correlations, we continue to believe active management is more attractive in fully valued markets as managers can selectively invest in differentiated, under-followed companies. Europe is well into its growth cycle as well, with equities outpacing the US at +6.5% in the quarter, and +22.8% so far this year. While political uncertainty appears to be the biggest risk to the recovery, playing catch-up with the US monetary and bank reform playbook has played out well for the region. We would be remiss to not speak of emerging markets. EM has performed well in the quarter (+7.9%) and has been the year-to-date leader at +27.8%. The falling US dollar has been a tailwind to EM, which has supported solid earnings growth. After such strong performance, we continue to have conversations as to whether there is still more to run for the asset class or if this is near the peak. There is plenty of data to argue both sides as P/E for EM is still only about 12.5x forward looking, which is relatively cheap compared to its 10-year high of 15x, especially when other markets are at the top of their valuations. Additionally, on a 3- and 5-year basis, EM has lagged the S&P and Russell by 500-1000 basis points. We are hard at work further diving into this space. Bottom Line: We remain constructive on the economy. Equities aren’t cheap but continued earnings growth should support valuations. While overall exposures remain unchanged, the complexion of manager styles and securities where we see the most attractive opportunity is in small- to mid-cap value companies that haven’t had the same crowding and momentum as the broader markets. International exposure may have sustained support of an economic recovery over domestic, but tax reform would be most accretive to domestic equities in the short-term. Obviously, the headline in fixed income is the start of the unwind of the Fed’s $4.5tn balance sheet. The greater risk is how securities that are priced off the risk-free rate will re-value as we move off its lows. It wasn’t a quiet quarter for rates, however, as the 10-year started off close to 2.4% before TIGHTENING down to 2.04% before bouncing back up to 2.34%. This was driven partially by muted inflation and rising geopolitical tensions, which were pretty much a yawn for risk assets. We recognize though that while the front-end of the curve is moving up, the 10- and 30-year points remain largely unmoved and flat. Corporate credit continued to grind tighter, supported by benign markets with stable fundamentals, the same factors that are driving equity markets. On the negative side, municipal debt, particularly high yield munis, had a scare right at the end of the quarter when President Trump, on the back of the hurricane devastation in Puerto Rico, commented that the territory’s debt should be wiped out. The general obligation bonds lost over 20% in value the following morning and the broader muni complex experienced outflows in sentiment. 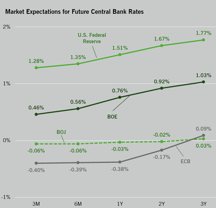 Bottom Line: As real rates rise, we expect a steepening in the yield curve to be gradual while the economy continues to hum along. Spreads will likely remain tight, which limits overall investment opportunities in traditional credit products. We are exploring more special situation and differentiated asset classes that could offer carry without being subject to broad market sensitivity. Liquid Alternatives – Hedge funds were +2.3% in the quarter for a solid 5.9% gain on the year, according to HFR. Equity-oriented strategies, specifically activist and long/short were the outperformers, returning over 3% in the quarter. While no strategy was negative, macro and managed futures continue to be the laggards in the quarter and year. Illiquid Alternatives – According to Cambridge Associates, private equity returned 3.9% in the first quarter, with preliminary estimates for the first half at +8.8%. Private real estate returned slightly under 3% in the first quarter, and +8% through the first half. Venture capital has lagged while global P/E has outperformed. Bottom Line: We continue to rely on hedge funds as an asset class that offers a generally lower volatility, lower correlation return stream to our long-only opportunities in equities and fixed income. Their ability to generate alpha will typically come from being a specialist in an under-followed segment of the market and being able to utilize shorts as a tool to both enhance returns and provide downside protection. However, as asset prices have inflated across the board with low volatility, we remain very discriminating in the space. Similarly, both private credit, equity, and real estate have experienced large uplifts in value. Thus, we seek specialists with an operator mentality that can put the effort in to protect and enhance their positions, rather than seek a higher priced take-out from a peer. Illiquid alternatives complement investment portfolios by extending investment horizons while being paid for execution and value creation (aka “earnings growth”) rather than being subject to the whims of market sentiment. Our focus remains grounded in a dedicated, disciplined asset allocation framework for each client portfolio. We continue to believe that portfolio diversification across asset classes facilitates a broad opportunity set for delivering returns in an environment of increasing uncertainty.